Tincenzo Lancia was one of the leading drivers of the formative years of racing but he carefully steered the company he founded away from serious competition. His son, Gianni, was less prudent and took Lancia into top-level sports car racing early in the 1950s, as a prelude to a Grand Prix entry in 1954. 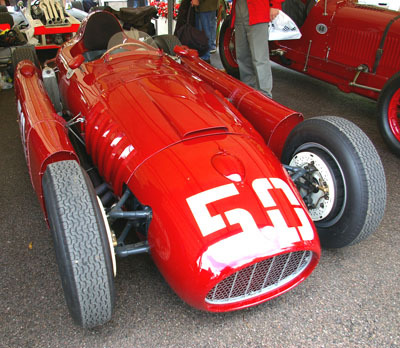 The cost was a burden the over-stretched company would not bear, and when it virtually collapsed in 1955 Fiat took over and handed the Grand Prix cars and team material over to Ferrari. The D50 F1 car was highly original, designer Vittorio Jano departing as far from convention as his Mercedes contemporaries but looking ahead. The 2489cc 90-degree V-8 was a high-rewing unit, which initially produced some 260bhp. It was used as a stressed member, with the front suspension and bulkhead bolted to it, and mounted at an angle to give an offset propshaft run for a low cockpit. Outrigged panniers betWeen the wheels carried oil (in the front of the left sponson) and fuel, which improved the airflow. A tail main tank was then the norm, and this of course led to changes in handlling as the load was used. 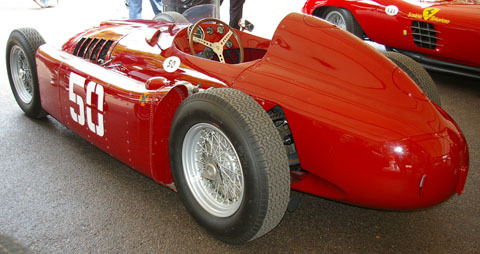 The D50 first appeared at the end of the 1954 season and Ascari took pole for the Spanish GP in its debut. The 1955 race season started well with Ascari winning two secondary Italian races and he was about to take the lead at Monaco when he crashed. His death in a sports car accident a few days later was the catalyst in the Fiat takeover. As Lancia-Ferraris the cars lost their individuality, although they were to win races and give Fangio his fourth World Championship. Drivers: Alberto Ascari, Eugenio Castellatti, Louis Chiron, Luigi Villoresi. As well as the outrigged panniers of the 050, this shot also shows the tubular wishbones of the front suspension, but not the thin leaf spring. There was a de Oion layout at the back. Although Lancia had used inboard brakes on a sports-racing car, conventional units were fitted to the D50.